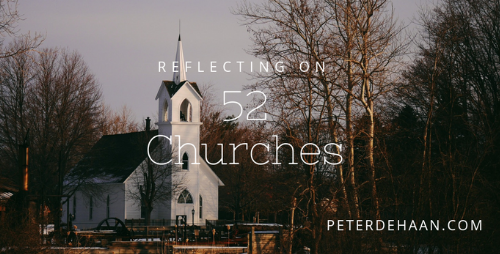 With our journey of visiting fifty-two churches over, I have the benefit of time to more fully reflect on the complete experience, starting with Church #1. Every week, it was hard for me to walk into a new church, but the first time was the hardest. Although terrified, I had a good attitude. Because of my positive outlook, I called it “a friendly church with a homey feel” and even admitted I could make it my church home—if I had to. That was correct, however, two things stand out as among the most awkward of our entire journey. First, being cornered by a hard-to-understand man, who recounted the diseases and deaths of his parents a few decades ago, was the most painful ordeal of the year. No one at the church made any effort to rescue us from his unfiltered monologue. As my face tried to smile, my insides screamed Will this ever end? Second, asking “first time visitors” to raise their hands with only seventeen people present was another awkward moment. Again, with a weak smile, I squirmed under the unwanted attention. Get me out of here! Though this practice may have a place in a church of a couple hundred, it’s nonsense for a small church where the visitors are obvious. I often share this experience as a humorous example of what not to do. The lesson is to examine our traditions and practices, considering what still makes sense and eliminating all else. What does your church do out of habit that drives away visitors and needs to be stopped?